As someone who cycles home in the dark every single workday of the year I'm always on the lookout for a good bicycle light, but bicycle lights can be boring and sometimes I want more than simple functionality, sometimes I want to add some fun to my rides. Lucky for me MonkeyLetric make such a fun light and they were kind enough to send me their latest light the enticingly named "M204 Bike Wheel Light" for review. With a name like that how could I refuse! 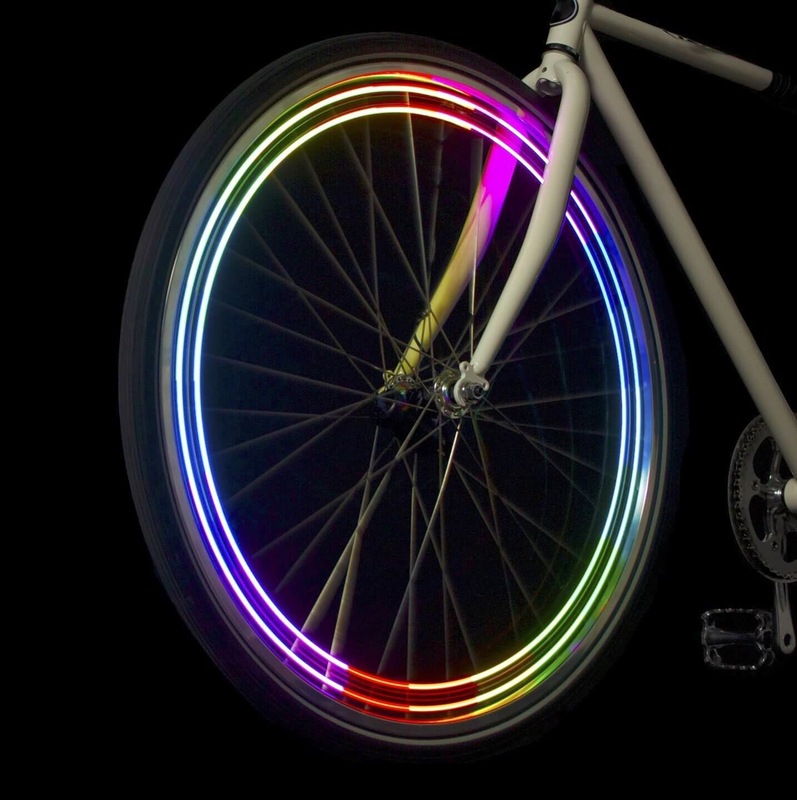 For those of you not "in the know" Monkey Lights are multicoloured led lights mounted to your spokes that produce colourful patterns and even pictures by rapidly switching on and off as your wheel spins. 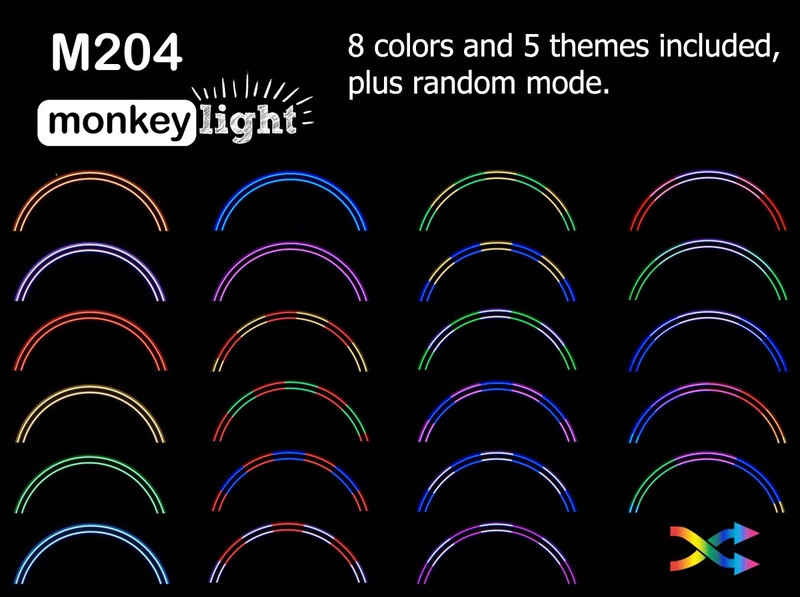 I've had my eye on the top of the range, 32 LED, M232 MonkeyLight for a long time now but some things have always put me off purchasing one. The first concern I had was how well it would stand up to the elements as my bicycle spends a lot of time parked outside in the weather. I'd hate to buy one only to have it die after a shower of rain. My second concern was the lights sheer size as I often leave my commuter bicycle in public parking where people tend to be less than careful about knocking over or damaging other peoples bicycles. I could see my lovely new spoke light being destroyed within a few days of use. Based on these concerns I've always looked upon MonkeyLights from afar with yearning. But all that changed with the release of the M204. Its a full colour, 40 Lumen 4 led spoke light with 5 pre-programmed themes. Much smaller than its cousin the M232, this light mounts between two spokes close to your rim, while he battery pack mounts around your hub. The installation instructions were easy to follow with clear diagrams and text in 1000 different languages. But even better than the written instructions is an instructional video on YouTube in which a lady with well manicured nails wearing a black dress demonstrates just how easy the Monkey Light is to install. So After viewing the video and doing my nails I slipped into a black dress of my own and set about the task of installing the light. It was hardly a task worthy of getting all dressed up for as it was extremely straightforward and took less than 10 minutes. The entire contraption is held on the wheel by zip ties. I admittedly had doubts about this, but after almost three months of riding with the MonkeyLight I've not once been the least concerned about the light or battery pack coming loose. As for performance, its really hard to see the patterns your lights are making as you pedal at speed leaning over your handlebars staring down at your front wheel. (Don't try this at home!) Yet the pointing, comments and shouts from the people I pass by indicate that I've certainly garnered some positive attention. While you may believe that this light improves side visibility only, the 40 lumen LED's are insanely bright, so much so that they project light down to the road 360 degrees around your wheel, not to mention that they are also capable of lighting up the general area around you. This makes the MonkeyLight M204 more than just a light for showboating fools like myself, but one that is also perfect for the safety conscious showboating fools as well. In general I've been very pleased with the light over the months I've been using it. It certainly gets plenty of attention and when your aim is to be seen that's exactly what you want. I've been parking in the elements and the wilds of Japanese public bicycle parking and have not had a single problem with the light and to be honest I held off writing this review until I had a chance to the M204 through months of real world cycling. I give the M204 MonkeyLight many thumbs up an would recommend it to anyone who wants to add some fun to their rides.